The winners and runners-up of the World TV Awards 2016 were announced on the 25 May during the Asia Media Summit which took place in Incheon, Korea. "Reel Time: The Price of Gold”, broadcast by GMA Network, Inc Philippines and directed by Mr Jayson Bernard Santos won the Award under Humanity Category for the Best TV Documentary on "Promoting Children's Rights". Mr Chang Jin, Director of AIBD, and Mrs Moufida Limam, Chief ASBU Director General Office Arab States Broadcasting Union (ASBU), who jointly announced the winner, presented a trophy and certificate to Mr Jayson Bernard Santos. For the announcement of the winner for the best TV Programme on "Encouraging Environmental Protection" under the category Science/Environment, Mr Chang Jin was joined by Mrs Dra. Rosarita Niken Widiastuti, President of AIBD General Conference & Director General of Information and Public Communication, Ministry of Communication and Information Technology (MCIT), Indonesia. Mr Chang Jin and Mrs Dra. Rosarita Niken Widiastuti presented the trophy and certificate to Ms Lara Ariffin, the producer of "Sumatra’s Last Tigers", directed by Harun Rahman and broadcast by Novista Sdn Bhd, Malaysia. As the Chairperson of the jury for the World Television Awards 2016, Mr John Maguire, Director of International Relations and Cooperation of France Médias Monde, explained the selection process of the Awards. The runner-up for the category Humanity was “The Way Home”, directed by Phan Thanh Phuong and broadcast by Vietnam Television (VTV), Vietnam. "Search for Water", directed by Narmandakh Nagnaidorj and broadcast by Mongolian National Broadcaster (MNB), Mongolia, was the runner-up for the category Science/Environment. Earlier in the day, a showcasing of selected World TV Awards entries, including the winners and runners-up programmes, was screened in front of all the delegates of the summit. The final jury session of the World TV Awards 2016 took place on 28 and 29 April 2016 at the AIBD office in Kuala Lumpur, Malaysia. The first day was dedicated to the Humanity Award selection, following the next day by the Science/Environment category. Mr John Maguire, Director of International Relations and Cooperation of France Médias Monde (FMM), France chaired the international jury. Ms Marini Ramlan, General Manager, Content Innovation & Digital, Primeworks Studios, Malaysia. Mrs Roziah Naam, Principal Assistant Director, Strategic Planning Department, Radio Television, Malaysia. Mr Kalle Furst, Consultant for NRK and Director of Furst & Father, Film and TV Ltd, Norway. The presentation of the World TV Awards will be held during the Asia Media Summit in Incheon, Korea, from 24 - 26 May 2016, a global gathering of broadcasters. The names of the winners and the runners-up will be officially announced on the 25 May 2016. This year, a showcasing of selected entries will be also presented during the summit for both categories (Humanity and Science/Environment). The World TV Awards 2016 are supported by Arab States Broadcasting Union (ASBU), Norwegian Broadcasting Corporation (NRK), Radio Television Malaysia (RTM) and Islamic Broadcasting Union (IBU), France Médias Monde, Asia-Pacific Institute for Broadcasting Development (AIBD). Considering the importance of the topics and anticipating an overwhelming response from Television Programme Producers, the deadline for programme submission of the World TV Awards is now extended to Monday 25th April 2016, which will be the final deadline. AIBD in collaboration with its global partners presents the World Television Awards 2016. 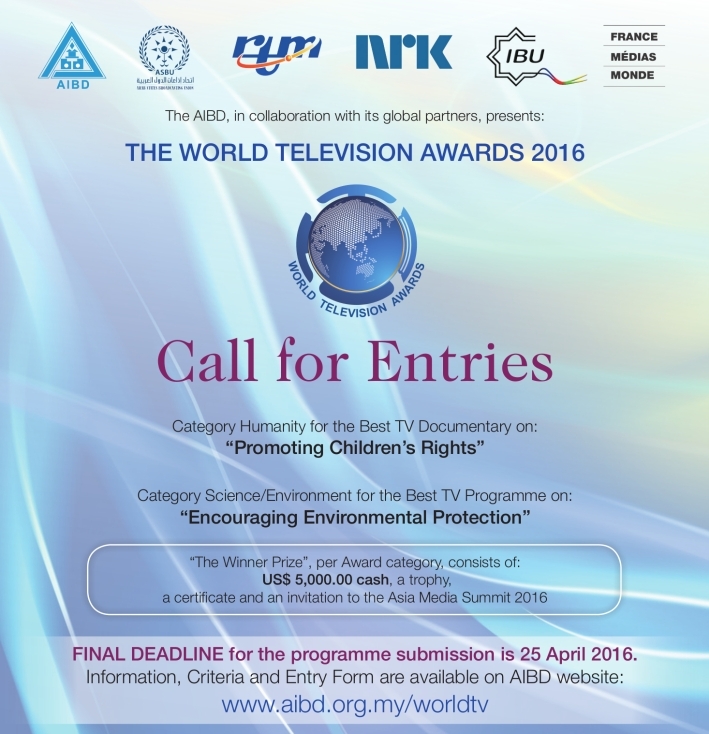 Category Science/Environment for the Best TV Programme on "Encouraging Environmental Protection"
Winners will be presented with their Awards during the Asia Media Summit to be held in Incheon, Korea from 24 - 26 May 2016, a global gathering of broadcasters. The deadline for programme submission is 1st April 2016.